The UASA issued a study on corporate governance of listed companies in the Arab financial markets. The study was prepared by the working team entrusted with implementing some of the UASA strategic plan tasks for the years 2016-2020. The team was consisted of six members including Jordan Securities Commission Securities, Securities and Commodities Authority of UAE, Saudi Capital Market Authority, Syrian Commission on financial markets and securities, Oman Capital Market Authority, and the Egyptian Financial Supervisory Authority in cooperation with the UASA General Secretariat. The study was based on a survey that was circulated among the UASA's members to identify the experiences of the Arab capital markets in the field of corporate governance in the Arab financial markets. The results of the questionnaire were studied and analyzed by the team to reach a deeper understanding of corporate governance of listed companies in the Arab financial markets. The study covered the most important international standards in the field of corporate governance and the means of ensuring its effectiveness, in addition to the practices of UASA members in the field of corporate governance and relevant legislative frameworks that govern the application of the governance principles in the Arab capital markets, especially with regard to those responsible for regulating listed companies in the stock market, in addition to the used methods to implement governance provisions and various mechanisms adopted to follow the commitment of listed companies to the corporate governance rules. The aim of achieving harmony of legislations and regulations among UASA members' is one of the objectives of the UASA's Strategic Plan for the years 2016-2020 through developing guidelines in several areas, taking into account the differences in their legislative and regulatory systems. In this context, the working team prepared a guideline on corporate governance based on the results of the study of the corporate governance of listed companies listed in the Arab financial markets. 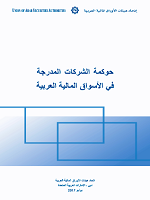 This guideline will assist in the development of regulations and rules of governance and meet the challenges facing Arab financial markets, their needs and factors affecting them, and the role of the UASA to reach the greatest commitment in applying the corporate governance principles and disclosure of listed companies in the Arab financial markets. It will also assist in upgrading the legislative and regulatory framework in line with best practices and international standards. The UASA Board adopted the guideline during its eleventh annual meeting held in Tunis earlier this year.